NEW YORK, Oct. 25, 2017—Planning funeral arrangements for a loved one can be stressful and expensive, but new findings from Funeralocity show that price is not the determining factor when selecting a funeral home online. 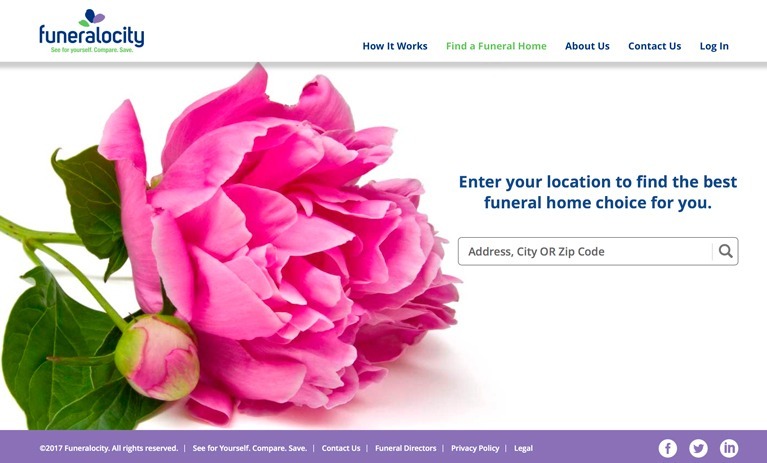 Compiled from data collected from online transactions on Funeralocity.com, a third-party comparison website for funeral homes launched in the Metro-Atlanta region in May, results show that consumers are looking beyond price when arranging funeral services to focus on quality and convenience. In addition, nearly half of online shoppers are looking to preplan their funerals. Due to the strong demand, Funeralocity is expanding into 24 of the top metropolitan markets by the end of the year. During the first five months of the comparison website being available, consumers using Funeralocity to find a funeral home purchased funeral and cremation services that ranged from direct cremations to elaborate funerals costing more than $15,000. Funerals were referred to Funeralocity Excellence Program members, funeral homes that have been vetted by the company and who have their funeral homes highlighted on the site, and non-participating funeral homes. Consumers receive an on-the-spot rebate for selecting a Funeralocity Excellence Program member. Kevin R. Marcy, owner of Georgia Funeral Care & Cremation Services said he was surprised by the effectiveness of Funeralocity. Reggie said more than 100 funeral homes have signed up to participate in the Funeralocity Excellence Program and take advantage of the growth in online funeral home shopping and consumer shopping trends. By the end of 2017, Funeralocity will be available in Atlanta, Baltimore, Cincinnati, Cleveland, Columbus, Fresno, Jacksonville, Las Vegas, Los Angeles, Miami, New York City, Orlando, Phoenix, Portland, Richmond, Riverside, Sacramento, San Diego, San Francisco, Seattle, St. Louis, Tampa, Virginia Beach and Washington D.C.
Funeral directors interested in learning more about Funeralocity are invited to stop by booth # 3430 at the NFDA International Convention and Expo in Boston, Oct. 29-Nov. 1, 2017. Funeralocity representatives will be available to discuss the benefits of participating in the Funeralocity Excellence Program. Funeral directors also can learn more about participating at funeralocity.com/funeraldirectors. Funeralocity is the latest venture of Future Factory. A privately-held company based in New York, Future Factory creates and manages startups. Future Factory brings management, capital and ideas together to invest in, grow and run smart businesses. Future Factory has successfully started and run companies involved in banking, healthcare, software, book publishing and other ventures. It currently manages a clinical trials research company and Funeralocity, a dynamic marketplace for funeral services on the internet. For more information, go to futurefactory.com.